1. Easiest to use, only a few clicks to complete the video conversion. 2. Convert High-Definition videos to iPad supported video formats like AVCHD(MTS, M2TS), MOD, HD AVI and HD WMV. 3. Convert Standard-Definition videos for watching on iPad, such as AVI, WMV, MKV, FLV, 3GP and more. 4. Extract soundtracks from the original videos to iPad/iPad 2 supported audio formats. 5. Multithreading and batch conversion enables a high converting speed. 7. Merge several videos and output them into one file. 8. Crop, trim, add text/image watermark and add special effects to personalize your videos. 9. 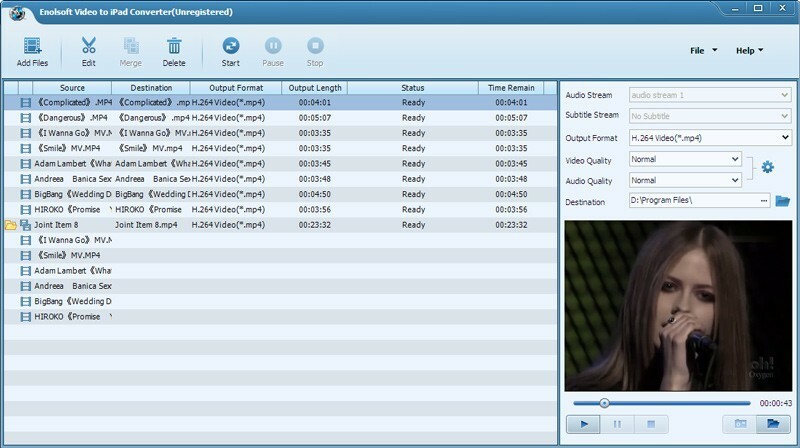 Batch conversion supported by Enolsoft Video to iPad Converter. 10. Preview the videos with its built-in video player and capture some pictures from videos.